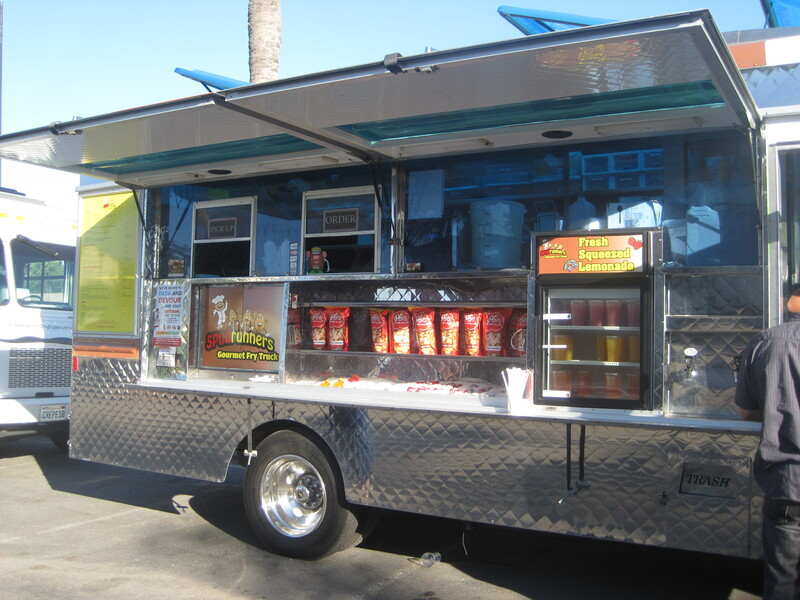 We decided to check out the new Saturday night food truck line up at Concourse Bowling in Anaheim. I was surprised how hard the alley was to find, given that I’d spent many a night bowling there with my friends in high school, but I did remember it’s next door to Camelot, and that got us close enough to see one of those poor unfortunate souls who get paid to stand out in the hot sun and wave a sign like a crazy person – except instead of pronouncing the end of the world, the sign pointed the correct alley to drive down to get to some yummy eats. Luckily for us, this place IS hard to find, because this is one of the few events we’ve been to where the lines weren’t crazy long, despite them offering a free game of bowling with our foodie purchase. Thus, we were finally able to try Spudrunners, which had a crazy long line the last time we made the attempt. Despite its name, Spudrunners actually has a neat customizable grilled cheese option. David got the grilled cheese with chicken, while I got mine with bacon. 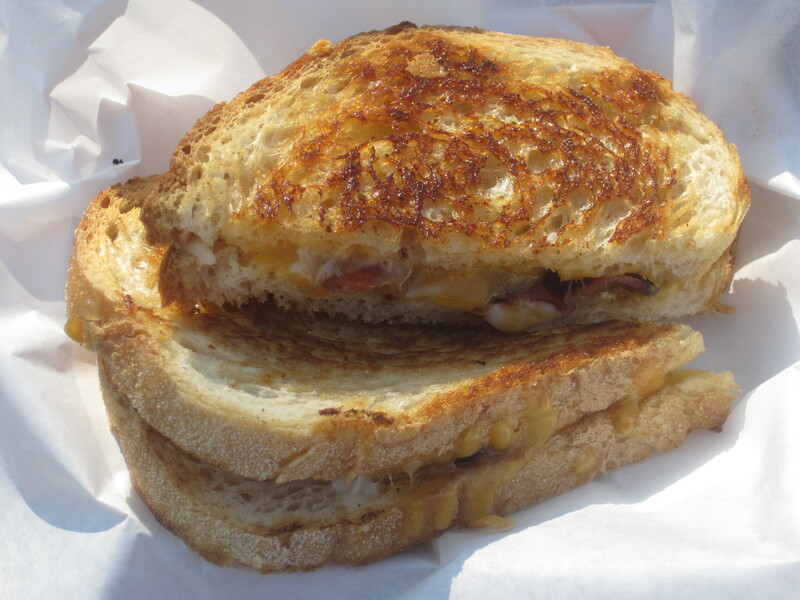 It’s a little on the expensive side for a grilled cheese, but the sandwiches were quite large, with toasty bread, lots of melty cheese, and tasty fillings. If we had to do it again, though, we’d probably just get one sandwich with both chicken and bacon. It was plenty filling to share. 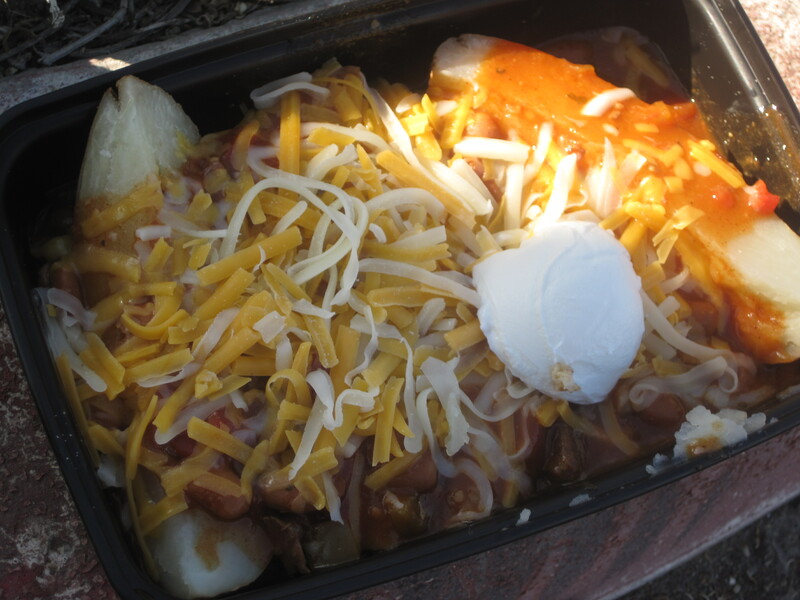 As a side, we got a Chili Cheese Baker, which was a baked potato, quartered, then smothered in a hearty tri tip chili, cheese, and sour cream. This was a meal onto itself, easily. Which is why we should have just shared one sandwich. But if you were just grabbing lunch on the go, this is the item I would totally recommend. The chili was quite flavorful without being too hot, and the whole thing would be great on one of those days where the marine layer is threatening to drop rain. In this context, the $6.50 price point didn’t seem unreasonable. It’s about what I’d pay for a loaded baked potato at my office cafeteria. So, we conclude Spudrunners is a win, although I’d recommend only ordering one item, or having a buddy to share with you if you want to sample their various items. Per their website they won’t be at the Concourse next week, but it looks like you can catch up with them at the OC Fair.